Milwaukee's Artistic & Experienced Architectural Firm - Best of Houzz! Wydeven Architects is focused on working with their clients in a team approach to design buildings that are artistic & unique. Our primary objective is to create designs that meet our client’s needs. We are a small group of passionate and dedicated architects. The firm was founded in 2008 by Stephen Bruns with the simple goal of designing and building well. We believe that through careful listening, rigorous study, strong relationships, and innovative thinking we can improve our spatial surroundings by delivering thoughtful, lasting architecture. We believe that every project deserves unique attention. We enjoy developing relationships with our clients, learning who they are and how they live and work, and comprehending their needs, aspirations and dreams. Through this process of discovery we help distill the essence of the project. The resulting vision becomes an invaluable tool that cultivates the design and construction process. We believe that our holistic approach is what sets us apart. Milwaukee's Award Winning Architectural Firm 5x BEST OF HOUZZ! Milwaukee-based firm specializing in highly crafted residential and commercial design. We offer a full range of architectural services from initial concept through final detailing and construction. Our small office specializes in collaborative design for new construction, additions and remodels that create functional and innovative solutions to the living environment. We especially love the challenge of older homes and embrace their inherent beauty and craftsmanship while bringing them into the 21st century! Please call for an informal consultation. Milwaukee's Experienced Architecture Firm | 2x Best of Houzz! Architectural firm specializing in custom single family residential as well as additions and remodeling. Other projects include small commercial and historic renovations. S.J. 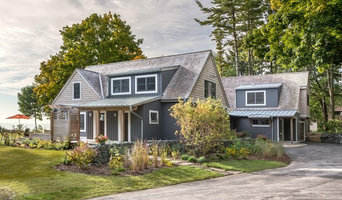 Janis is an award-winning design, build, and remodel company based in Wauwatosa, Wisconsin, and has served the greater Milwaukee area for over 63 years. Specializing in creativity, we work with clients to create the perfect setting for their lifestyle whether at home or at work. Karl Holtermann Designer + Builder LLC provides the the complete architectural design and construction services to residential clients who choose to do a variety of projects. Many of my clients are busy professional with a high expectations. I exceed expectations. "I work closely with clients to achieve the design you always wanted but never could have come up with on your own". My 20 years of experience working closely with craftsmen and craftswomen of the highest caliber allows me to do virtually any type of remodel or addition. As the Designer and Builder nothing is lost in the translation from imagination to reality. I am the only person you need to meet with. It's my job to coordinate, schedule and manage subcontractors so we all have a clear future. Many clients choosing to remodel have heard or experienced horror stories. It is my job to make this a positive experience, and an enjoyable process you will fondly recall for years. Proudly, many of my clients are repeat customers. The scope and budget of my projects varies greatly based on the needs and goals of clients. It is my job to listen to your goals, needs and objectives to provide for you the ideal solution (s) so you are able to make decisions. Our approach to designing your home or building is very interactive and you will have the opportunity to provide review and feedback along every step of the process. Award-winning custom residential design firm specializing in natural and contemporary design. Led by licensed architect, Ken Dahlin with 25 years of experience and with projects built and published nationally. Ken is licensed in 6 states and is on the Frank Lloyd Wright Wisconsin board of directors and is an adjunct professor at the UW-Milwaukee School of Architecture & Urban Planning. DavisDesignStudio is a small, full service, residential architecture and interior design firm. We specialize in new home design as well as additions, remodels, and renovations. I specialize in new residential design throughout Southeastern Wisconsin and beyond. With almost 20 years experience in the residential industry, I have an eye for detail and a wide base of experience to draw from. I listen to my client's dreams and desires and turn them into their dream home. Visbeen Architects has been in the business of bringing architectural dreams to life - from unique, custom-designed homes to entire neighborhoods – since 1992. We believe that every project should possess a sense of place; that it should tell a story. Drawing cues from the client, the environment, and materials, we craft timeless practical buildings. CHRYSALIS: HOME STUDIO provides residential design services for new homes, additions, and whole-house remodels. Projects of any size, large or small. Versed in most styles of architecture: arts & crafts, bungalow, craftsman, contemporary, cottage, deco, mid-century, mission, modern, prairie, usonian, etc. Design/business philosophy: a home should be simultaneously in harmony with its site, its inhabitants, and an established budget. The lasting value of Architecture is in its ability to be more than simply functional. It lies in the capacity to blend carefully selected materials with technology for comfort and convenience; to express the values and requirements of its users; and to thoughtfully use the precious resources of the planet to help ensure a sustainable future. At Hundt Architecture we seek to bring these values into every project we design. Honored to be professionally designing custom homes and remodelings for 23 years. Blending each clients' wishes, lifestyle and site with thoughtfullness and creativity. Wade Weissmann Architecture is a nationally recognized boutique architecture firm, with over 15 architects, artists and staff. Surprisingly located in Brown Deer, Wisconsin, we collaborate with clients on projects across the United States and Europe. Our work spans residential projects, equestrian estates, master planning, commercial design. And the occasional bespoke cabin in the woods. We believe that architecture is ultimately about elevating our clients’ lives. From the smallest haven at the water’s edge to a gracious, rolling estate designed to welcome generations of family gatherings, we believe architecture–and the process of developing architecture–should be a rewarding and life-enhancing experience. Our reputation for delivering heirloom-quality architecture has spread largely through our clients, whose kind words have been the greatest source of on ongoing growth. Our mid-continent location eludes our midwestern work ethic and down-to-earth approach to client service. We like to do our very best to give our clients what they want. Ideas that our clients have might sound crazy to some become reality with us. We have an amazing team we work with to make your dreams come true. Our owner Terry Schuelke has over 25 year in the construction industry and even more in the design side. We are Very detail oriented and try very hard to meet all the needs and wants on your wishlist for your project. We are not happy unless you are satisfied with your design. Our goal as designers is to make something you have been dreaming about a reality. Fein Design is a premier residential design-build firm located in Mequon, Wisconsin. We have completed work of merit and character for a wide array of residential clients. Our talented staff specializes in all aspects of design, from home remodeling and additions, to custom home designs. We can also help with your kitchen remodeling, bathroom remodeling, or basement remodeling project. No project is too big or small! Our design methodology encourages client participation and collaboration with designers, consultants, engineers and our skilled contractors to create the highest quality result. We believe in creating an architecturally balanced design that incorporates good flow patterns in and around the home, as well as the homes relationship to the natural surroundings. ASID Interior Designer & Licensed Residential Contractor rooted in the slow, soulful lifestyle of the European countryside. How do I find the best West Milwaukee architect for my home design project? It is best to hire a home architect who will be involved in all phases of the design process, from the initial concept to the completed construction. The architect is often the first person you will hire for your project. If necessary, they might also help you select and hire Wisconsin subcontractors, which can include the builders, engineers and landscaper. Interior architects are also involved in negotiating contracts for all involved participants. It is for these reasons that it is extremely important for you to have a good relationship with the West Milwaukee residential architect you hire. He or she can be the tie-breaking vote between you and the general contractor and can be your biggest advocate during the construction process. Different architecture firms in West Milwaukee, WI provide different services, so the scope of the work can span from pre-design environmental impact studies to selecting furniture and finishes, depending on what your specific needs are. It is very important to hire the right professional for the job. Remember that the most well-known or established designer might not provide the best architectural services for your needs. It all comes down to the individual project. Research and ask people whose work you like for recommendations. It's important to have somewhat of an idea of the style of house architecture that you prefer, as well as the amount you would like to spend. Residential architects in West Milwaukee, WI are natural problem solvers. They will assess the entire situation and help you to solve your problems too. Don't settle for a single company too early. Call and interview a few. Make sure that you feel like your personalities will mesh well and that you like their professional perspective. Find a home architect in West Milwaukee, WI on Houzz. Narrow your search in the Professionals section of the website to West Milwaukee architects. You may also look through photos of Wisconsin projects to find interior architects and building designers who have worked on a project similar to yours.